Weaving is an amazing craft which is using beautiful wooden tools: looms, shuttles, frames and more,is a complex process. You bring together different elements to make a larger picture. These tools are works of art and even more incredible is the fact that they have been around since the same time our ancestors were developing stone tools- around 10,200 BC. 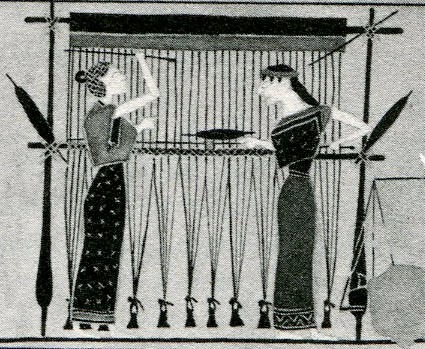 The weaving is an ancient art in Greece, Very Popular since the Homeric years when Penelope was weaving at her loom all day and all night according to the historical myth. 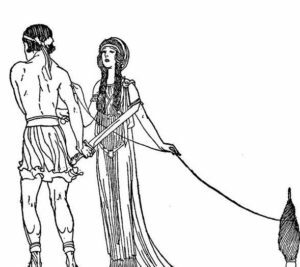 One of the historical myths is presenting to us the Minoan years were Ariadne, daughter of King Minos she was in love with a young Athenian named Theseus. Theseus was a founding hero for the Athenians in the same way that Heracles (or Hercules) was the founding hero for the Dorians. Theseus, son of Aegeus decided to be one of the seven young men that would go to Crete, in order to kill the Minotaur and end the human sacrifices to the beast. So Ariadne who fell madly in love with him decided to help Theseus. She gave him a thread (a red woolen skein) and told him to unravel it as he would penetrate deeper and deeper into the labyrinth, so that he knows the way out when he kills the beast (Minotaur). Theseus followed her suggestion and entered the labyrinth with the thread. Theseus managed to kill the Minotaur and save the Athenians, and with Ariadne’s thread he managed to find his way out from the labyrinth. Theseus took Princess Ariadne with him and left Crete sailing happily. The ancient Greeks had the knowledge of the silk since the Persian Wars. Goddess Athena was the protector of the weaving. In many weaving items we see symbols and styles from the old years like the tree of the life, the two headed eagle, the birds and many more. 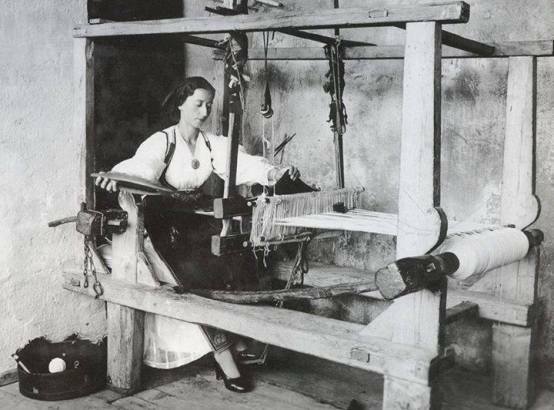 Years back in Crete the weaving art offered a type of self-sufficiency in each household that had its own loom. The most important think to be able use the loom is to be supplied with wool. The wool is a fibred material which is mainly coming from the sheep’s hair but also from other kind of animals. 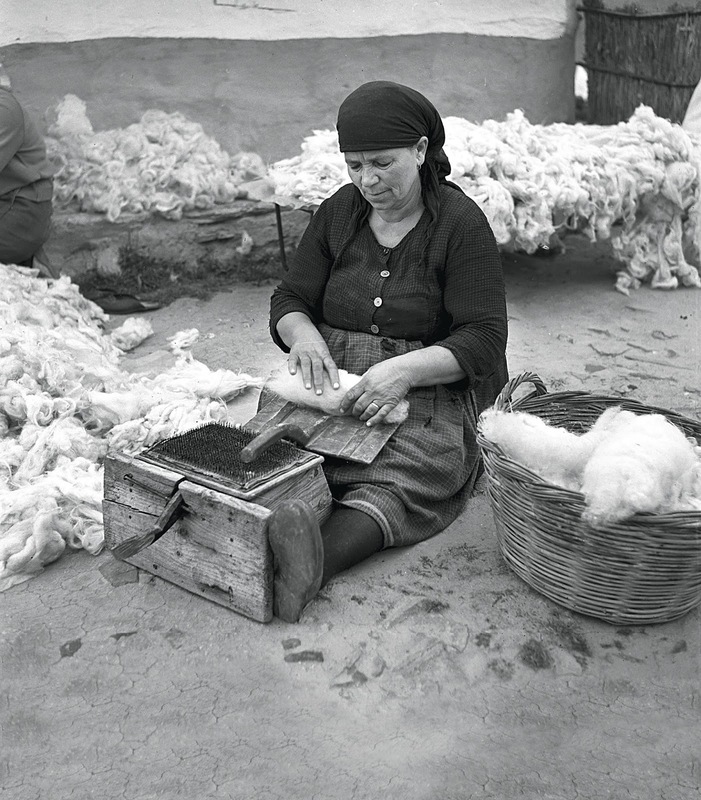 The main usage of the wool is for weaving, in the construction as insulation, in chemistry as a cosmetic ingredient. The kind of the wool we collecting is depending on the animal’s skin and it’s categorized, woolen mainly called the sheep’s hair and cashmere the goat’s hair. The main progress for the production of the wool is the hair collection from the animal and then the edits to be formatted in thread. The first stage is the hair cut of the animal which is undertaken from specialist using special products like scissors or electric shavers. 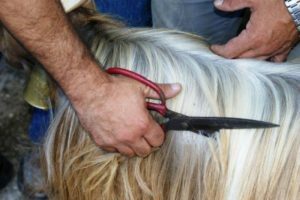 The hair cut usually happens once a year during the Spring period so the animal will have the time to replace the hair back to be save from the cold in winter. The Washing The next stage is the washing of the hair. Using a big deep pan with hot water and soap to move away the bacteria and the chemicals they use for the animal’s skin protection. Brushing Afterwards as the wool was clean the following step is the brushing, The purpose of the brushing is to neat the wool. Divide The next step of the treatment is the spinning, which the shaved wool passes from the foamed form to thread. Traditionally, this work was done by womens who held the unwrought wool in one hand and with the other they were pulling a small amount which they extended it with the help of a rock. The stretching and shaping of the thread is carried out by the twisting of the wool, removes a large volume of air that exists between them and in some way arranges the fibers in first form of the thread. Color The final step is the paint of the hair and it’s only for the white ones as the dark hairs stays at the same natural color or painted in black. The Cretan ordinary womens apart from creating their own cloths on the loom for any occasion or either for their dower they use the loom as a way of expression and freedom. After 400 years of slavery the art of the weaving and loom was a way out for them. The tiredness of their soul find a way to escape and a create a unique way to talk through the folklore weave tradition. Indifferent creations they entered the old wooden chest keeping the tradition of the folklore soul well guarded. A soul that took life from the sound of the loom.This is an art which was engaged in the ordinary womens life style and now it has been lost in the years.